Considering what has been done with the HRPs for the Caribbean and Nuclear Winter addons, I am sad to see that the DukeDC HRP hasn't seen any update since over a year now. Therefore, I am calling out for heroes to help me in bringing back some life to this unfinished project. While I'm at it, I should do something about the horrendous antenna model I made in Milkshape back in '06 (IIRC). I might have a go at making some of the tiles myself, but don't hold up any hopes as my skills are more geared toward Tech-Drawing/Diagrams/Black and White pencil. Still, I will try if I get a chance (I've got a lot going on right now) maybe even try making a couple of Normal/Parralax maps - though it would be better if someone else did it, I hope you get a good artist/modeller in for this. I guess I could probably have a look at MapHacks and see about putting Polymer lights in... once more, I am not promising anything, but I shall make a note of it. DukeDC is one of the easier addons to finish, since it does not contain new HUD weapons and other standard sprite replacements (for armor, enemies or the like) as you know them from other addons like Duke Caribbean. I think the tiles which are still missing can be done over time, and fiddling around with the existing ones (there aren't THAT many) shouldn't be a lifetime's effort, either. Would be a shame if this didn't get finished, for it's still the best of the official addons which had been released back then, at least IMHO. Main thing is something happens after all, and I thank everyone showing interest in assisting. I agree. I just wish it had come with a custom soundtrack as well . You know, we should have SVNs for our three add-on HRPs. Edit: yep just figured it out, I should be able to do the polymer lights now when I get around to it. The similar blue panel should arrive in the next few days. These photos were taken with ambient lighting set to minimum The only way for the level to get the most out of polymer lights is if it's dark, and apparently DC makes a lot of use of textures with negative shades. The contrast is perhaps most prominent in the second photo, with black pillars (due to natural shading) and the rest of the white house as fullbright. The skybox is wrong in those pics. Negative shades are used indoors as well. While Duke3D was more of a darker set of episodes, DC is much brighter in order to emphasize the Washington based architecture. This was good back in 1996 but now we want to emphasize the architecture with lights instead. I'm not sure how well the two can be mixed together. I'm currently working on adding polymer lights to the amazing Duke Nukem 3D addon: Duke it out in DC. I had all the DC HRP stuff in an (edit: really) old folder so some of this might be a bit outdated but it's the lights that are the important thing here. In terms of framerate, without FRAPS, I got a solid 30 fps with my nVidia GeForce 9800 GT, and quad core @ 2.33gHz, although I'm told having more than 2 cores doesn't make much of a difference. This includes being in the outside area with 3 super powered spotlights, so I think most modern computers will be able to handle it. Don't know about the performance but it looks great. Much better than most original levels with enhanced lighting. , I'll move forward with this list. wow that's a lot of lights... anyway give it a playthrough and tell me if there's anything I should change/improve et cetera. Oh and I found a neato thing you can do with lifts. Check out the one with the blue lights if people wanted me to I could exaggerate that effect, change the colours and so forth. No haste, it will be used but NF is probably busy right now (like most of us). Keep up the good work. After you're done with the episode I would gladly see you improve some original maps. 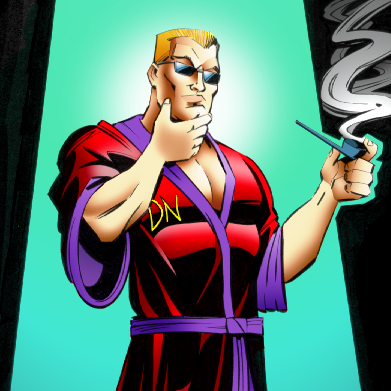 Will a SVN be made for Duke it out in DC? The newer shotgun was just recently removed in favor of the old one. Keep in mind that NightFright runs the DCHRP, not me. Yeah, though we can re-add the new one as soon as it gets 1) a texture 2) an animation. The model itself is better, I think. Ok. BTW, how do you get Wally Waffles Edition to work with eduke32 without hrp? Never mind I got it to work, but it has alot of con errors. It does startup and play. Can't really tell anything different from regular Duke it out in Dc. I got it to work without the con errors. And after reading the readme text, I can see all the new stuff Wally added.